My family celebrated Thanksgiving two days late this year. On the Saturday after Thanksgiving, my parents arrived early in the day to watch their college play its big football game, and my brother and sister-in-law arrived shortly afterward. The game was nearing its end, and I was in the kitchen reheating all the food I’d prepared in advance (including a green bean casserole and a No-Fu loaf) and getting ready to cook the Brussels sprouts and warm the gravy. With seven seconds left in the game and everything needing a few more minutes to be truly hot, the electricity went out in my entire neighborhood. A call to the power company confirmed what I knew from experience: it could be hours before the power was restored. I was not going to let the meal get any colder. Working by candle light, I had everyone bring the food to the table and ordered my husband to get the camp stove in from the garage (panic over food makes me quite bossy). You’re not supposed to use this kind of stove in the house, but I was determined to heat the gravy. You see, everything else can be lukewarm, but hot gravy pulls the meal together. The dinner was a success, the camp stove fumes didn’t kill us, and my parents found out that their team had won the game in a surprise upset in the 7 seconds that they missed. Oh well. We consoled ourselves with pie–Double-Layer Pumpkin Cheesecake and apple pie–by candlelight. My mushroom gravy is always an ad lib affair; I don’t think I ever make it the same way twice. Here’s the basic recipe, but the amounts of herbs should be adjusted as necessary–more for blander foods and less for highly seasoned dishes. In a medium-sized non-stick saucepan, saute the onion until beginning to brown, about 5-10 minutes (adding a pinch of baking soda speeds things up). Add the mushrooms and 1 tablespoon of water, and cook for another 3 minutes. Add the garlic, and cook, stirring, for another minute. Add the vegetable broth, herbs, nutritional yeast, sherry, and soy sauce. In a bowl, whisk or blend (with a hand blender) the “milk” and flour together until smooth. Add it to the saucepan and stir well. Simmer, stirring occasionally, for 15 minutes. Season with salt and pepper to taste and serve. You can make this gravy more palatable to mushroom-haters by blending it until smooth. 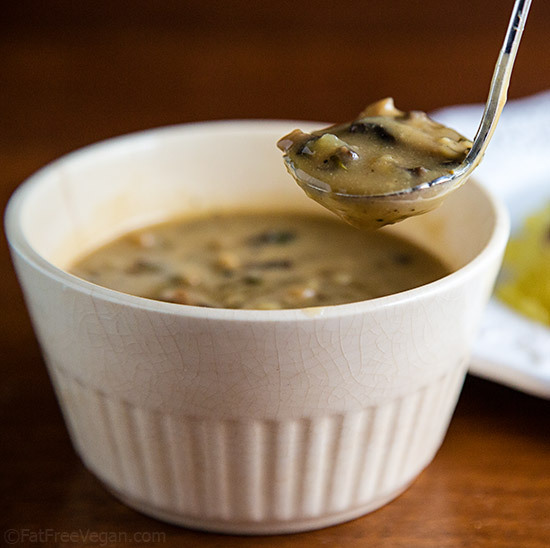 For a smoother gravy with some pieces of mushroom, blend only half the gravy. May your holidays be warm and bright (with or without electricity)! When you say non dairy milk, what do you usually use? Almond, soy…….? Thank you so much for all that you do!!!! 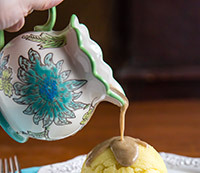 I just made this gravy for the first time and loved it! I’m wondering if it can be frozen – what do you think? Lisa, yes, it should freeze fine. I’m so glad you liked it! I’m so excite to try this! When struggling with my newly Vegan lifestyle gravy is my go to comfort food. I usually need to go to a restaurant for good vegan gravy. I will save so much money having this recipe. Can you use all veggie broth instead of non-dairy milk? 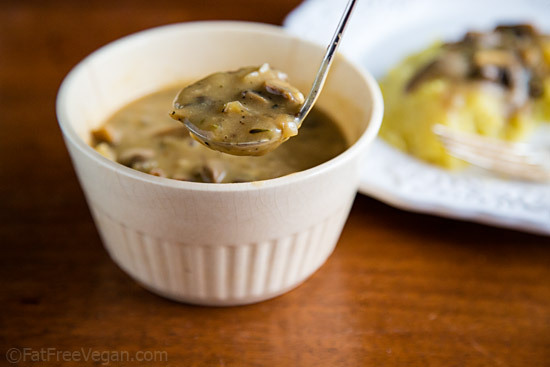 Since becoming vegan, I’ve only made gravy with cornstarch so I’m excited to try this TOMORROW (Eeek!!). Can I sprinkle the flour in the pan or (try to) make a roux? I’m nervous about whisking the flour with the broth and ending up with a pasty or raw flour taste. Sorry for the lengthy post. Thanks!! Yes, feel free to use all veggie broth. You can brown the flour if you want, though I’ve never noticed a pasty flavor. Hope you enjoy it! Hello! If I were to used canned mushrooms, how many cans? Could you give the amount of mushrooms in cups? Thank you! You can also use potato starch as a gluten free option – and a smoother gravy in my experience. It blends in beautifully. Potato starch also makes a a good ingredient for a gluten-free, fat-free brownie. Oh my word! This is delicious! I made it for my son who is vegan for health reasons and we all loved it! It went faster than traditional turkey gravy! I am not gluten free, is the arrowroot necessary, or will regular flour work? Or would cornstarch work? Just made this tonight and it was awesome. Thank you very much, I’m sure we’ll do this and variations of it quite often. Holy cow, this stuff is magic. Thank you!! Oh, Susan, this gravy is sooo very good. I must admit I added celery, savory and some poulty seasoning because it was easier to do when I decided at the stove to double the sauce. Golly, I could eat this as soup !!! Thank you so much and Happy Thanksgiving! 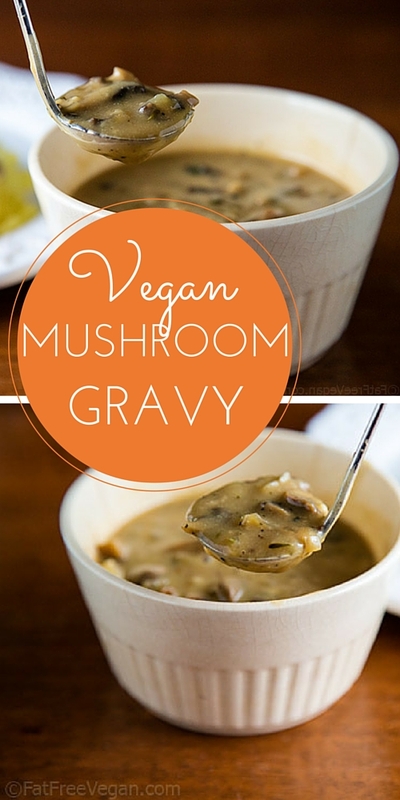 I hate mushrooms but I LOVE this gravy. Thank you so much for sharing. I just dish around the mushrooms for myself. Made hubby very happy as well!